In India, home-made butter is valued and loved. Most families make at least part of what they need at home. In old days, people made it by churning the full cream yoghurt or dahi, using a hand held Mathani or 'Ghotni'. Mathani is a wooden whisk, with a star shaped churning end on a thick stalk. Small ones are rolled between palms. Larger ones can have a piece of thin rope attached to aid the churning process. This is the traditional instrument used for making butter in India. These days, most families use an electric whisk. They remove and collect the thick cream that sets on top of boiled milk as it cools. This is called Malai/Malaai. It is collected in a container which is kept in the fridge. Every 3-4 days, it is churned/whisked to make butter. There are other ways of making butter too, see below. Butter more than 3-4 days old begins to go off in Indian heat. So it is heated to make Ghee or Clarified butter. Home-made butter can be frozen in small portions and will last for 3-4 months in freezer, if wrapped well or kept in airtight containers. My late mother used to make it from yoghurt from yoghurt, but for me, it takes too long. It is much easier to make it from thick cream or malai. I have not given any amounts there, it depends upon how much you have of the main ingredient. Edited July 2018. Malai or thick skin that forms on top of boiled and then chilled milk (by-product uncultured buttermilk). You need, fresh, full cream milk for this. Making butter from Malai or milk skin/top: Boil the milk, cool and then chill in a refrigerator. Chilling the milk gives a thicker Skin. Remove skin/malai using a slotted spoon, so that all milk is left behind and you only lift the skin off. Collect skin/malai for 3-4 days, until you have at least a bowl full. Keep it refrigerated. When you are ready to make butter, leave it out for a few hours, to come to room temperature. Place in a large bowl and beat with an electric or hand blender/whisk. You will see the butter and milk separating in front of your eyes. Butter floats at the top as fluffy bits. Lift the butter out using a slotted spoon or with your fingers and place in a bowl. Remember to collect the drained buttermilk in a pan, this will make low fat Paneer or yoghurt. Wash the butter a few times with cool, fresh water, turning and gently squeezing it with your hand. It is this milky water that makes the butter go off if not washed away. Press the final product gently with hand to remove as much water as possible. You can salt it if you wish, but I prefer it unsalted. Malai, the thick milk skin is quite often used in India in its own right, in place of butter, as a toast topping. It is mixed with a little sugar or salt and pepper. It is also used as cream, beaten and mixed with sugar, to serve with fruits. 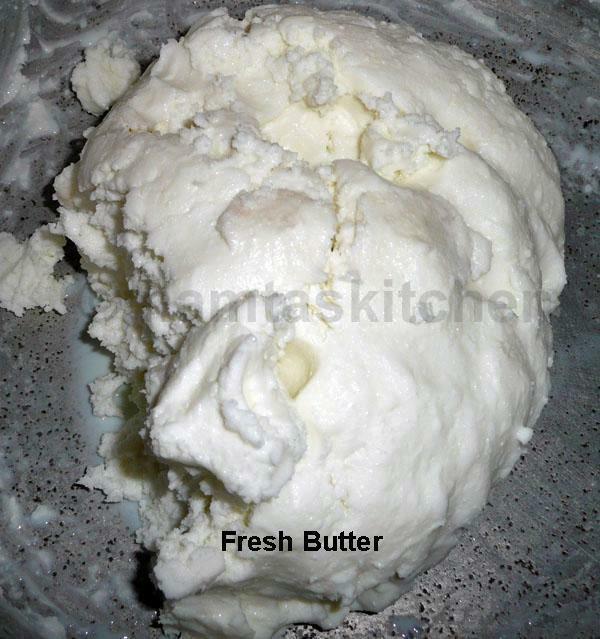 Making butter from Yoghurt/Dahi orCurd, as yoghurt is called in India. Make yoghurt from full cream boiled milk. Allow it to return to room temperature. Whip with a hand or electric whisk until buttermilk begins to separate and you see butter as soft, fluffy lumps. This may take 10-15 minutes of continuous whisking. Turn whisk off and lift the butter with a slotted spoon or your fingers. Place in a bowl and wash as in previous method. The resulting buttermilk from this method is Mattha or Chaach, a popular drink in India.